Tuesday afternoon at Ark City, in the opener, Ark City defeated Coffeyville 11-0 in the first semi-final. The Lady Crusaders squared off against Winfield in the 2nd semi, and unfortunately came up short in the end, 1-4. Season over, Winfield went on to play the host Ark City and the Lady Bulldogs had little trouble with the Lady Vikings, winning 12-0 and advancing onto the State 4A Tournament slated for May 24th-25th at Emporia. Want to thank the WHS Yearbook staff for the semi-final pics below vs Winfield. The plan was for wellington.cc to cover the Championship game that followed, which of course didn't happen for the girls in red this go-round. The Varsity Lady Crusaders advance to 10-10 on the season. The Varsity Lady Crusaders advance to 8-10 on the season. When the opposition has 41 hits and 33 runs in two games,you know the Home Team is in trouble. The Lady Thunderbirds dominated the action Monday night at Worden Park, (as did the wind! ), downing the Varsity Lady Crusaders 12-0 (5 innings) and 21-13. Wellington lead 13-10 after 4 in the nightcap but runs and hits continued in the last half of the game for the visitors, Circle put up 11 more runs in innings 5, 6 & 7 for the eventual 8 run victory and sweep. The Varsity Lady Crusaders are now 7-7 on the season. It's a LADY CRUSADER SWEEP!! Perfect evening at Worden Park, all the way around.Sunshine, a light breeze and pleasant temps were Mother Nature's contribution / 23 hits and 22 runs, compliments of the Lady Crusaders. Wellington's bats exploded in the nightcap with multiple singles, 5 doubles, 1 triple, and 1 home run by Jacelyn Buck. In the nightcap, it was tight until the top of the 4th. Andale, up 1-0, lit it up, scoring 7, followed by 2 in the 5th, to claim the eventual 7 inning victory 10-2. Wellington couldn't get their bats going, only 2 hits with 3 errors. Annika DeJarnett (0-1), pitched for 3.1 innings, giving up 4 hits, 6 runs and 1 walk. Wellington High School’s Brooke McCorkle, a 6 Ft. Junior, left handed pitcher, 1st base, powerhitter has verbally committed to play D1 softball at Mississippi Valley State University, in Bena, Mississippi, in the heart of the Mississippi Delta. Brooke plays travel softball for the Tulsa Elite 16U out of Broken Arrow, Oklahoma. She is also on the WHS Volleyball & Powerlifting Teams. Congratulations Brooke!! That is awesome!! The Lady Crusaders end the season @ 14-8 and just a run or two short of going to the 4A State Tournament! "9" WHS Seniors at "2" Ball Parks were honored along with their parents as regular season HOME games draw to a close. The Varsity and JV Softball squads hosted McPherson Monday afternoon in double-header action at Worden Park. No reports from JV action but Varsity Girls, like the Varsity Boys, took care of business and snagged 2 wins over visiting McPherson. The opener was tight but with a bottom of the 7th Lady Crusader run, the win was secured at 4-3. In the nightcap, Wellington jumped out early but McPherson battled back to a tie in the 4th and then the guns unleashed for Wellington, scoring 8 runs in the 4th, 5th and 6th for the easy 11-3 victory! Both the Lady Crusader Softball Teams and the Crusader Baseball Teams were in action Thursday here at home, the former at Worden, the latter at Hibbs-Hooten. The WHS Varsity squads were able to win 3 of 4, the Lady Crusaders sweeping the Lady Indians to advance to 10-4 on the season! The Crusaders took care of business in the opener but fell short in the nightcap, moving their record for the season to 6-9. The Varsity and Jr. 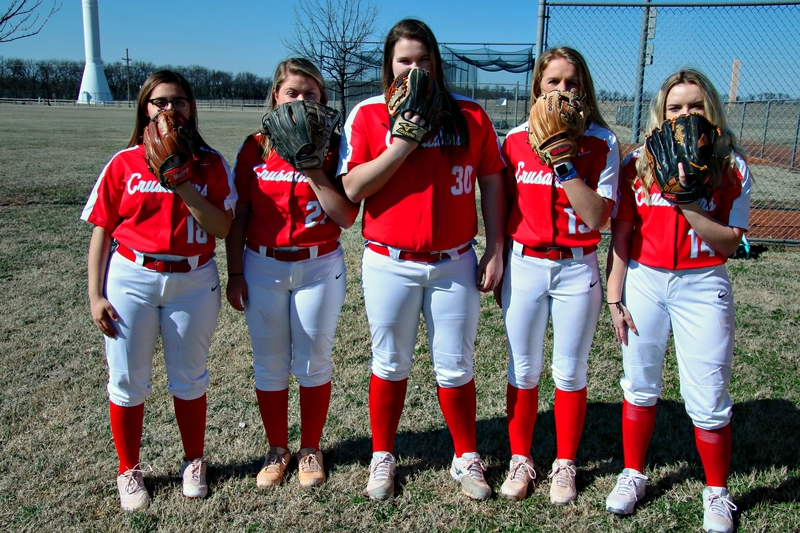 Varsity Lady Crusader softball squads had their season "HOME" openers Monday evening out at Worden Park. Not a bad evening at all weather-wise, a little windy but just warm enough to make it quite bearable for most of the evening. Mixed results from Field #1 and Field #2 action vs the Lady Orioles of Augusta. In the opener, with Madi Lewellen on the mound, the Lady Crusaders suffered numerous errors resulting in a 6 inning win for the visiting team in orange, 15-4. Much like the BOYS over at HIBBS-HOOTEN, the nightcap was going to be the HOME TEAM's to claim and the Varsity Lady Crusaders did just that with Brooke McCorkle on the mound. Down 10-7 in the bottom of the 7th, Wellington touched home plate 4 times and secured the come from behind victory, final score 11-10! Whew! AWESOME!! The Varsity Lady Crusaders are 3-1 on the season and head to Andale on Thursday for make-up action there. (postponed games from WEEK #1 of the season) The JV Lady Crusaders battled hard and came up short in their opener 3-7. No report on the JV nightcap outcome.